Ethel is a sleek mini-panther who was born on 5/1/18. This sweet girl was found after being abandoned in a box in a parking lot! She was rescued, lovingly fostered, and is now seeking her special person. Is your home missing a furry black cuddle-bug? Come meet Ethel and let her fill your house with love and purrs! 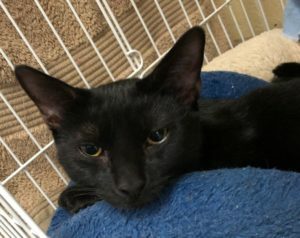 This entry was posted in 6 to 12 Months, Adopted, Adopted Cats, Cats, Female, News, Wantagh Adoption Center. Bookmark the permalink.